How to create a "Sign-up or Sign-in" user flow policy in my Azure AD B2C directory? 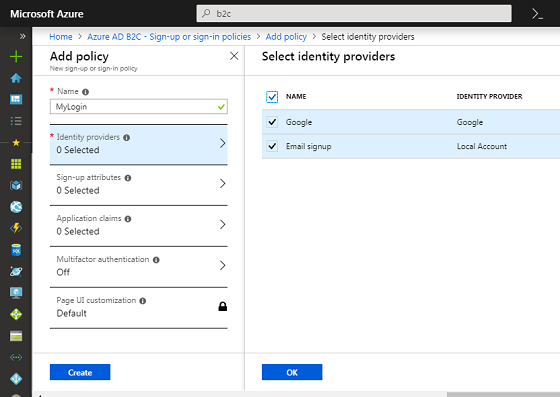 If you want to build a "Login" link on your Web application, and redirect your users to Azure AD service to display a "Sign-up or Sign-in" page for you, you need a create a "Sign-up or Sign-in" user flow policy. 1. Sign in to the Azure portal as the global administrator of your Azure AD B2C tenant. 2. Make sure you're using the directory that contains your Azure AD B2C tenant by clicking the Directory and subscription filter in the top menu and choosing the directory that contains your tenant. 3. Choose "All services" in the top-left corner of the Azure portal, search for and select Azure AD B2C. 4. Select "Sign-up or Sign-in" under the "Policies" menu. You see a list of existing user flows. 5. Click "Add" above the list. You see the user flow policy screen. 7. Select "Google" and "Email signup" as "Identity providers". 8. Select all profile attributes as "Sign-up attributes". This will be used in the new sign-up form. 9. Select all profile attributes as "Application claim". This will be used in the "id_token" body. 10. Turn off "Multifactor authentication", if you don't need it. 11. Take the "default" as "Page UI customization". 12. Click "Create" to add the user flow. A prefix of B2C_1 is automatically appended to the name. So the final flow name will "B2C_1_MyLogin". Note that "Email Signup" is the interface to sign-up new users directly to the Azure AD B2C directory.